Shame can have a horrible long –lasting effect on a person’s mind. In every situation after a life-changing painful memory, a person’s negative feelings and emotions can alter the way he or she see the world. Plus these toxic emotions send out brain waves which subconsciously alters the way others perceive that individual. This brain function is powerful in the way we interpret reality. The way we perceive the real world transforms our brains. Individuals who believe their barriers are too difficult to overcome, see the world in a negative light, and they find themselves always constantly frustrated over events that present obstacles. However, individuals who learn to overcome the shame associated with the past, find themselves seeing a world filled with many opportunities, for they know how transform their trials into triumphs. This new brain perception allows people to find joy in almost all situations. And this joy jump-starts previously shock-paralyzed portions of the brain. In turn, this energy produces more brain fire and neurons unleashing your ultimate brainpower. This energy creates a wave known as Triabrain power as described in the Huffington Post article, “Traibrain and Answers Unleashed” written by Olympia LePoint. Read the article here. “Which is worse? If you heard that a woman gave birth to her step-father baby? Or two young boys calling a young girl “tramp?” Surprisingly, both have equal damaging effects. Trauma-related issues affects 1 out of 3 women across the world as author April Joy explains. As the Author of three best-selling books, April Joy Ford is an expert on helping people understand the effects of trauma. Despite being a former successful technical professional and a successful business owner, April Joy Ford became an expert on overcoming trauma, because she lived through experiences that movies are made about. Now showing thousands of people how to overcome trauma through her radio show “You Are Not Alone,” April Joy explains that trauma is not what you think. Trauma is taught early in life. And if we are not aware of how it is taught subconsciously, we spread it instead of transforming it. Listen as April Joy shares the “4 truths of Awareness”, so trauma survivors embrace a thriving approach to a new life. Miraculously turning tragedies into triumph, April Joy Ford is a best-selling author and host of a weekly live global show “You Are Not Alone” with VoiceAmerica Empowerment. Despite being an engineer at Intel for over 13 years previously, April Joy realized that her faith in her future was far greater than her past trauma and even her well-paying job. She walked away from her six-figure income to become a Best-Selling Author, Speaker-Radio Host, and Transformational Coach. 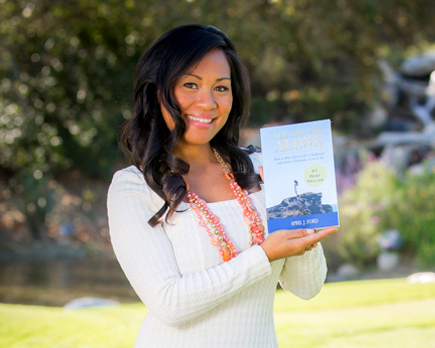 Her books include: “You Are Not Alone- How to Rise Above Life’s Challenges”, “Journeys To Success – Women’s Edition” and “Chase the Challenge and Conquer.” As a survivor of childhood sexual abuse and later becoming a widowed single parent at only 32, April’s tragedies gave her the opportunity to “hit the reset button” on her own life. And now she teaches audiences across the world how to triumph over trauma. Visit Joysofyah.com for more information.